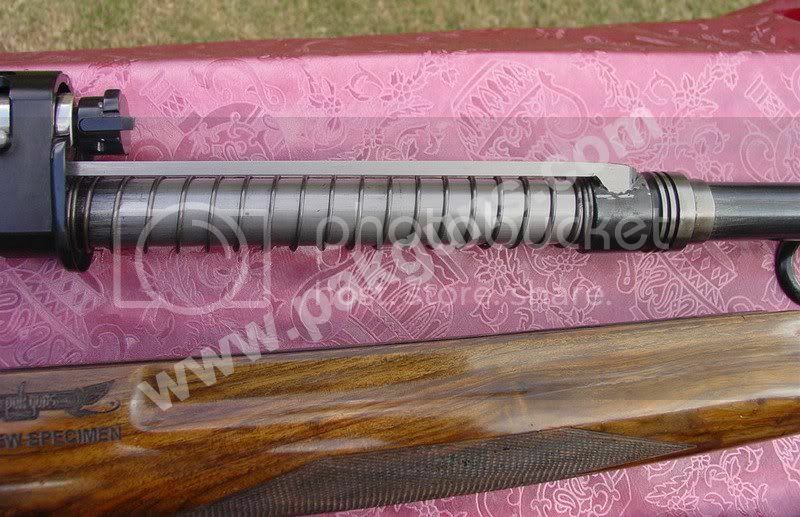 One of the many evils facing an autoloader shotgun is the carbon fouling that occurs due to the employment of propellant gases in cycling the action. This type of a scattergun uses the force of the gas, created by the accelerated burning of the propellant, not just to propel the wadding which pushes the shot down the barrel, but also to cycle the action, eject the empty shell and load another from the magazine. This though efficient, is far more complex than traditional break-open shotguns thus mandating a through cleaning and maintenance regime to keep everything working. Timing is everything in the smooth functioning of an autoloader. All autoloading shotguns depend on a precisely timed sequence of events. If one step is slow, it can upset the sequence. A dirty chamber, filthy action, crud in your trigger group or magazine or a weak spring can alter the timing just enough to turn your soft shooting automatic in to a jamomatic. 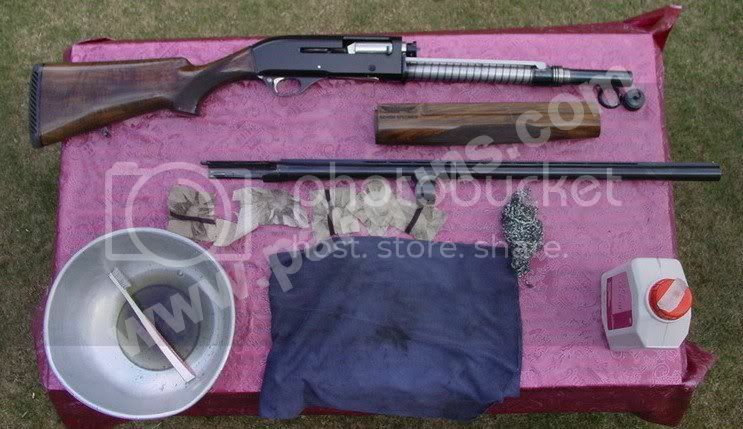 How often you should give your shotgun a through cleaning will depend on the shotgun, your loads and the environment in which you shoot. Keep track of the numbers of shells that you have put through the gun since the last cleaning and make note of when the gun first starts to cycle slowly. A pattern will emerge that will tell you how often the gun should be taken apart and cleaned. It could be as few as 100 rounds or as high as 1,000. 1. Up to 100 rounds: Just run a solvent soaked patch down the bore a couple of times. 2. Up to 200 rounds: run a solvent soaked patch down the bore a couple of times, take the barrel off, no need for any further disassembly and wipe everything with a solvent soaked path. 3. Up to 500 rounds: run a solvent soaked patch down the bore a couple of times, take the barrel off, remove the chokes and clean them with a solvent, take the trigger assembly out, no need for any further disassembly and wipe/clean everything with a solvent soaked path. 4. 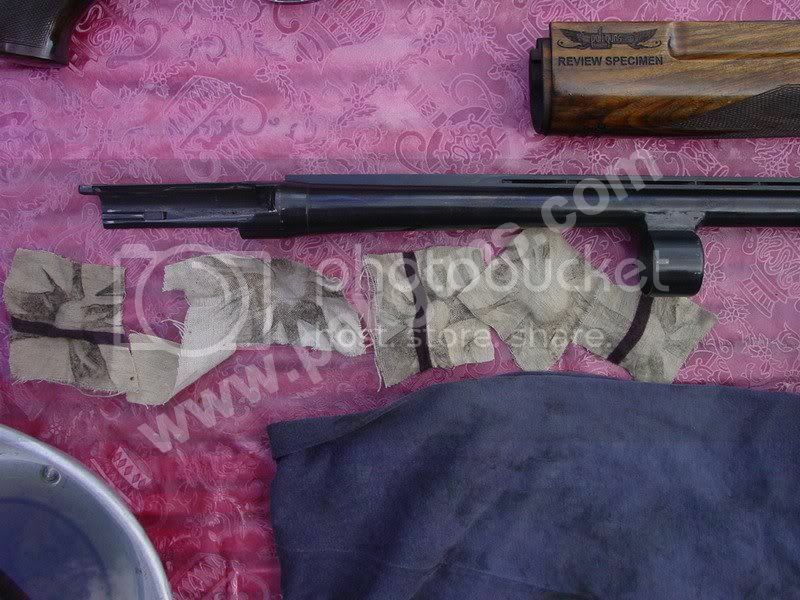 Up to 1000 round: disassemble the gun down to bits and clean/scrub everything with a quality solvent. 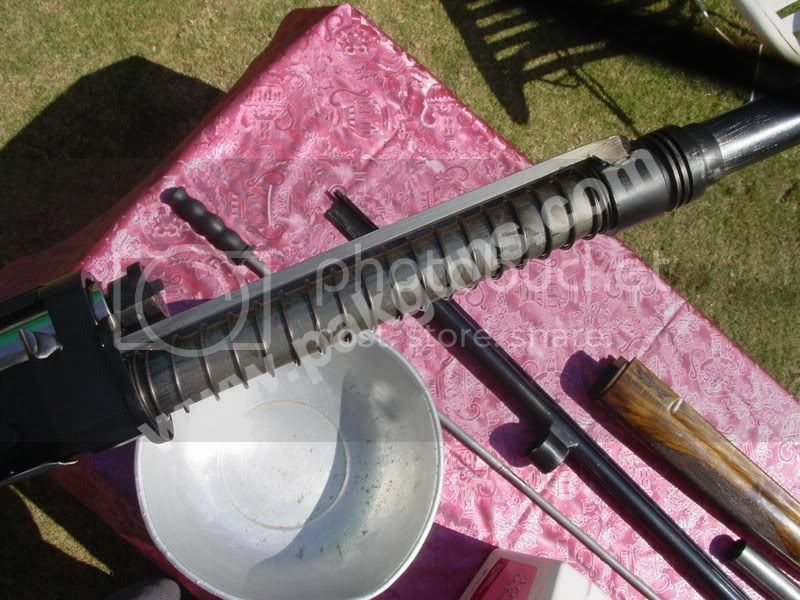 Preferably, fix the barrel in a jig and using a cleaning rod attached to a hand held drill, polish the bore. It can also be done manually (the old fashion way) but with lots and lots of elbow grease (the old fashion way). “Be sure you always handle your firearm safely. Always keep the muzzle pointed in a safe direction, treat the firearm as if it were loaded, and keep your finger off the trigger. Pull the bolt-grip back, and release it. Repeat until no shells are visible in the magazine tube or in the chamber. After visually inspecting that the firearm is empty, manually insert your finger in the chamber and cartridge elevator to feel if there is any cartridge in there. Be double-sure your firearm is unloaded. You do not want an unexpected boom while cleaning your firearm. 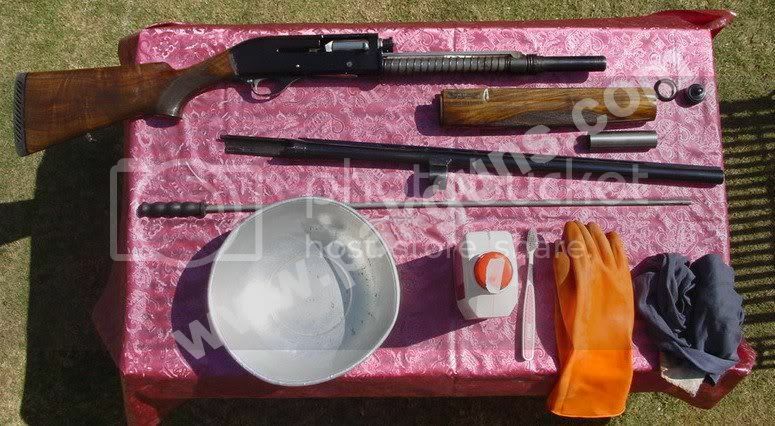 Keep your ammunition separate from your shotgun while cleaning. Disassemble the gun, take the magazine nut off, remove the forend, take the barrel off, remove the trigger guard, keep track of all the things, where they came off and where they'll go. 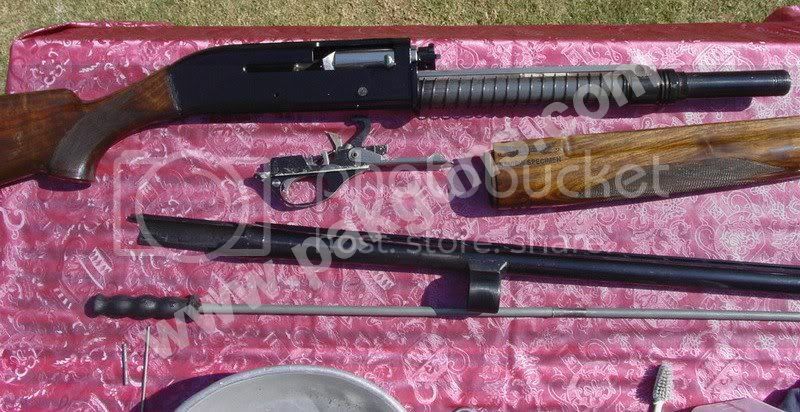 This is what an autoloader shotgun generally looks like once disassembled. no need for further disassembly unless the round count is hitting 1000 mark. Look at all that grime/carbon fouling/dirt/debris. 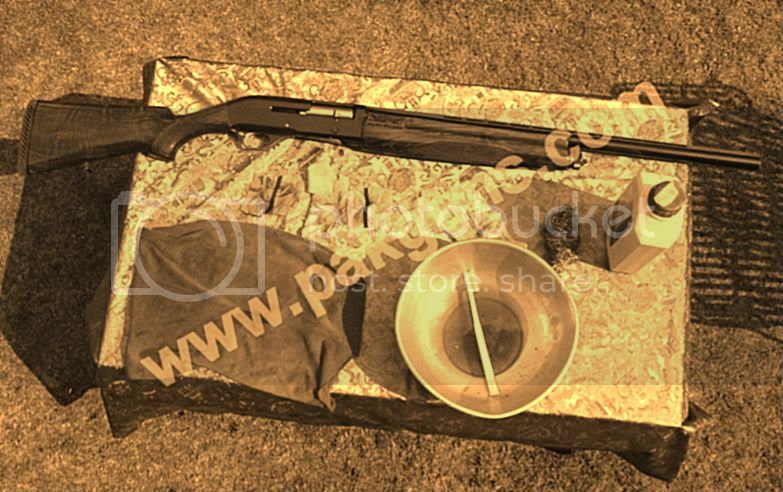 This is the true cost of the pleasure that you get after shooting an autoloader shotgun. A closer looks reveals the burnt/scorching marks left by hot gases. no worries. nothing a quality solvent soaked scotch brite/steel wool cannot handle. Scrub all your worries away. over time I have developed a special liking for steel wool as it not only removes gunk/carbon fouling/burnt marks but also polishes the metal to a mirror shine. however I cannot insist enough to use the softest steel wool available or if you want to play it safe, use a scotch brite pad. our objective is to clean and shine, not to remove the finish. 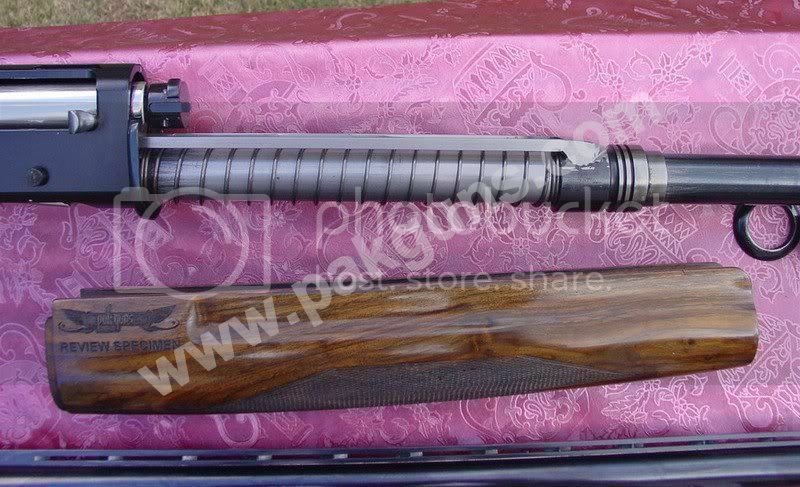 many high end shotguns offer hard chrome plated internals for the very same reason. to withstand serious scrubbing and to aid in cleaning. with scotch brite pad due to its relative softness to a steel wool, you'll require more effort (in other words, more elbow grease). one more thing, do not use steel wool on anything that has been colored, painted, blued, browned, blackened and parkerized. 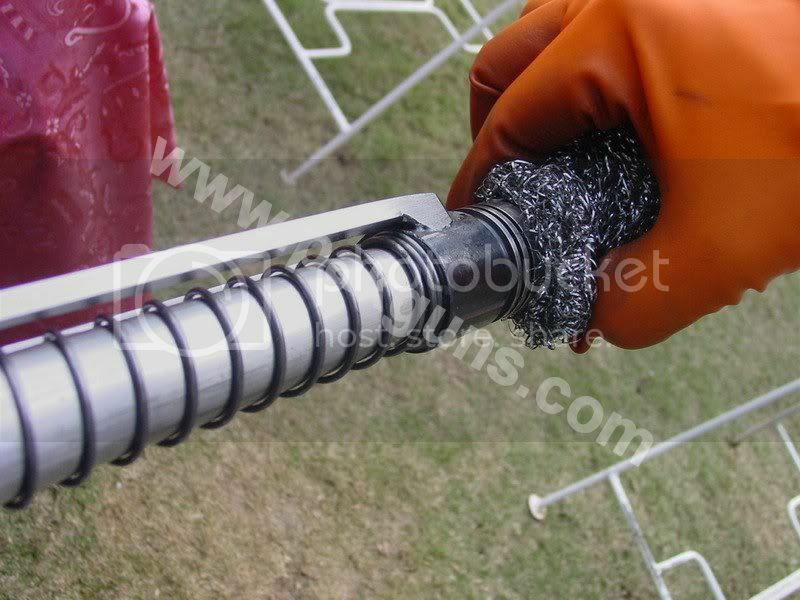 steel wool is for stainless steel and hard chrome plated parts only. Everything all clean and shiny. as far as the internals of the receiver is concerned, all it needs is a blast of solvent followed brushing with a tooth brush to losen all the grime/carbon/gunk then another blast to flush away all the nasties followed by wiping everything down with clean cotton cloth. pull the bolt back to make more space inside visible and also to make space for the brush to go in and do its thing. make sure to brush the bolt face and its surroundings. special attention need to be given to the cuts and crevices inside the receiver. they collect the most nasties during operation. A good bast of your favorite solvent/clp along with brushing everything with tooth brush should clean the trigger assembly. This should also improve the overall trigger feel of the gun. now moving on to the barrel. using any quality bore solvent (caution: bore solvents are strong chemicals, use in open well ventilated area only) applied on a cotton patch, run it through the barrel bore a couple of time. let it sit for a couple of minutes. in the meantime you can remove the choke and clean it with the same bore solvent. then go back to the barrel bore and using clean (dry) cotton patches (one by one) clean as much as you can. remove as much of the carbon and plastic fouling as you can. your objective here is to make sure that the final patch comes out clean. I normally suggest that you use multiple clean cotton patches one by one till the time the the final patch comes out reasonably clean. since we are dealing with an autoloader shotgun that depends on hot gases bleeding through gas ports in the barrel, we must vigorously clean this area as well because this area usually accumulates the most of grime/carbon/gunk. one may use a scotch brite pad or steel wool just remember to scrub the inside of the gas cylinder and not the outside as it will remove the finish (bluing or whatever). every patch has two sides so you can use the same patch twice by simply inverting it and having another go at it. as you can see that the final patch still shows some carbon/gunk on it. 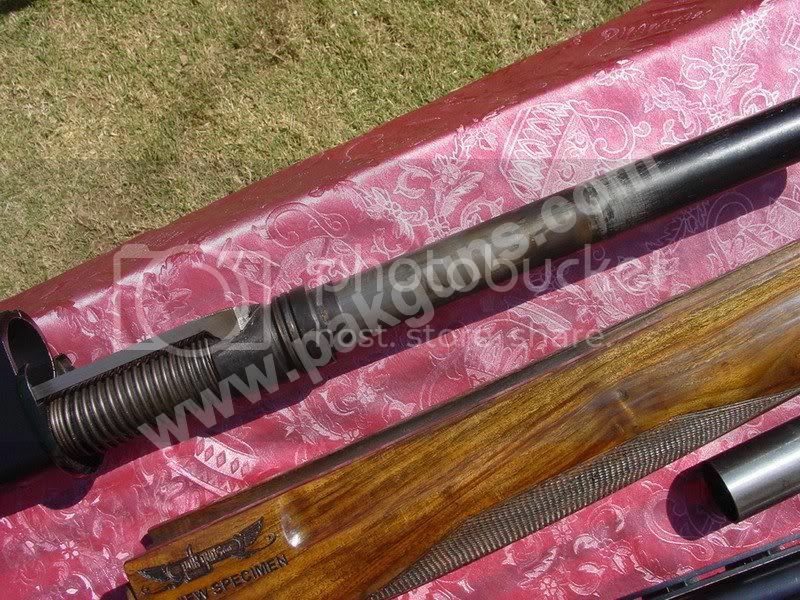 but since its only a shotgun and i'm not going to use the barrel as a drinking straw I do not need to go any further. With everything clean as it should, lubricate everything as per your lubrication preferences and put the humpty dumpty back together again. p.s. More Text will be added later.